Before summer official leaves us and we say hello to fall (believe me, I am so ready for fall! ), I’ve been reflecting back on this summer: what we did differently from last summer’s training and how the particular challenge of the last few months have ultimately made me a smarter, stronger runner. My summer running motto was “learn to embrace the sweat.” It first came to mind last year when we were training for the Disneyland Dumbo Double Dare challenge and with two half marathons on the docket this fall (plus some smaller races in between), this summer was all about embracing the sweat and staying hydrated in the hot, humid weather (shout out to the amazing folks at Nuun and their fab healthy hydration options! #liveclean). Since mid-June, I’ve been “injured” and didn’t run for about 4-ish weeks/most of July. I use the term “injured” loosely here. I did something to my right knee in June (still not really sure what) and on one of our Sunday long runs had a weird tingling/tickling sensation on the inside of my knee with every step I took. It wasn’t painful; but constant enough to be annoying and uncomfortable. When I got it checked out by a sports medicine doctor, the diagnosis was pes anserine bursitus. Exactly. Basically a tendon on the inside of my right knee was inflamed which caused the bursa to become irritated (for the record: I, myself, was also irritated) and produce too much fluid. A little set-back? Yes. Detrimental to our training schedule and fall races? Not necessarily. 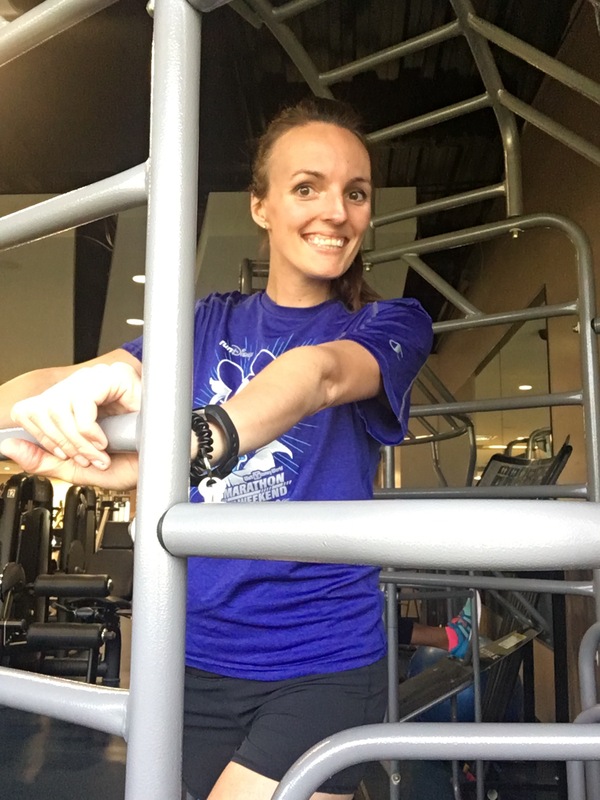 ​After looking at the videos, there was an interesting discovery: my right leg likes to cross over the midline (#crossovergait) which not only isn’t good, but also makes my hips shift in a funny way while I run and could be contributing to my knee discomfort and inhibiting healing. My left leg (which has been fine and happy through all of this, by the way) is in-line where it should be. Later the same day, I was getting ready to do an exercise on a table and my PT came over and noticed that even when I was lying down, my right leg naturally fell more inward. She moved my leg so it was parallel with my left leg and fell straight below my hip…it felt like I’d swung my leg out to the side. So weird! Could this be exacerbating my bursitis? Probably. Have I always been running like this? Perhaps. Could it also be a culprit of my scoliosis? Possible. How fascinating! We’ve been starting to incorporate some agility drills into the PT mix to try to re-train my right leg to not crossover the midline, like drills on a ladder (haven’t done that since high school basketball) and very targeting strengthening exercises. I’ve kept a very positive attitude about all this and have discovered that, for even a seemingly small “injury” like bursitis, patience is key. Just like training for a race: in order to heal and get stronger, you have to put in the work. I have about a month left in PT and I’m excited to see more improvement and also learn what I can do to keep these muscles strong and healthy going forward. Stay tuned! Hi, I'm Natalie! Just a tall girl living in the 4th smallest state. I enjoy coffee, running, beer, reading, being crafty, and I'm an avid Green Bay Packers fan.